Police in Los Angeles have arrested a man suspected of fatally shooting the rapper Nipsey Hussle on Sunday. Eric Holder, 29, was reportedly on the run for two days before his capture in Bellflower - a Los Angeles suburb, around 20 miles (32km) southeast of where Hussle was shot. In a post on Twitter, the LAPD thanked the "community for the heightened awareness/vigilance" following the man's arrest. It is not known how the police found him, but reports say he was detained by sheriff's deputies until the LAPD arrived to make the arrest. According to police chief Michael Moore, the men knew each other and they had a "personal dispute" in the hours before the rappers death. 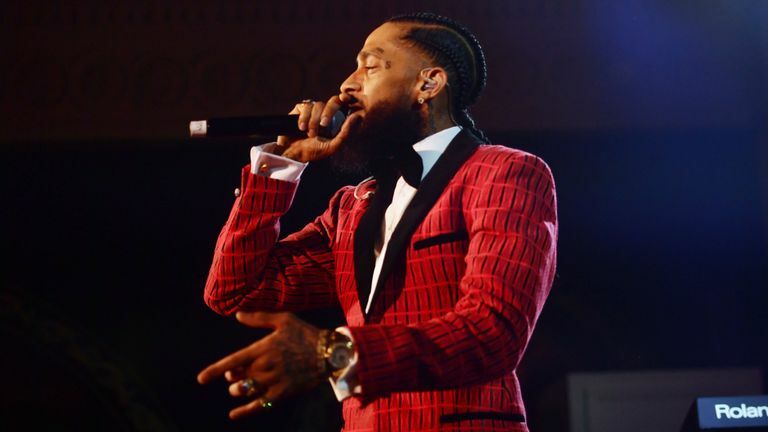 He added that the men had several arguments on Sunday, and Holder went to Nipsey Hussle's store with a handgun and shot at him and two other men - who survived the attack. After the shooting, Holder fled in a white Chevy Cruz that was waiting for him, driven by an unknown woman. A postmortem on Monday revealed that Hussle was killed by gunshots to the head and torso, and his death was certified as homicide. A vigil was held for Nipsey Hussle outside his clothing store on Monday, but the scenes turned chaotic, after a stampede was triggered by reports of gunshots, which later turned out to be false.